When my friend Jennie, who cooks and crafts over at Frolic & Detour, gifted me a jar of her homemade (and homegrown!) greengage plum-vanilla bean jam, I couldn’t wait to bake up a batch of brioche buns and get spreadin’. The sweet-tart, generously (but not overly) vanilla-y jam is beyond compare, it worked beautifully with the buttery buns! The only problem, whenever I didn’t get to the bread quickly enough — say within a day or two — or forgot to pop the rolls in the freezer on day one, I had a bunch of dry brioche on my hands, but I still wanted to get my greengage fix. The solution is simple: bostock. This French pastry transformed those nearly desiccated, inedible slices of brioche into something special with a quick dip in an almond-scented syrup, a slick of greengage-vanilla jam — or any jam of your choosing — and a frangipane-sliced almond topping. In the oven, the almond syrup caramelizes, creating a slightly crisp crust around each slice, the interior of which once again softens without getting mushy. As for the “frangipane” — a cheater version that simply combines canned almond paste and butter — it gets nice and crackly, creating a lovely contrast in textures. 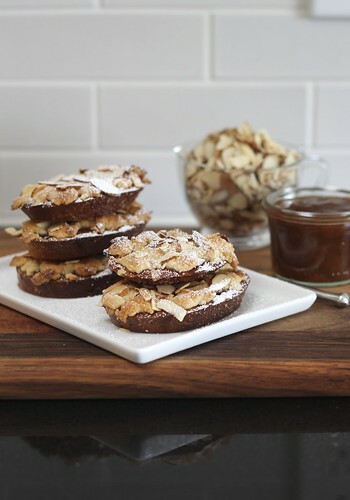 I’m partial to serving bostock for breakfast or as an afternoon snack — it’s particularly good accompanied by coffee or tea — but it’s great at any time of day, even as dessert! In a small saucepan (2-quart), combine water and sugar. Bring to a boil, stirring occasionally, over high heat. Boil for 1 minute. Pour syrup into a low, heatproof dish (such as this 3-cup rectangular Pyrex), stir in almond extract and allow to cool slightly (about 15 minutes). While syrup cools, prepare frangipane. In a small bowl, stir together almond paste and butter until smooth (it will be quite thick); set aside. Preheat oven to 375°F. Line a small, rimmed sheet pan with a sheet of parchment paper; set aside. Trim (discard) a small amount from two opposite sides of each bun. Slice each bun from top to bottom into 6 slices, each about 1/2″ thick. Once the syrup is cool enough to touch, quickly dip each slice of bread on both sides into the syrup. (If the syrup is still too hot, you may apply the syrup to the slices with a pastry brush instead.) Arrange, with the larger area cut-side up, on the prepared pan. Spread each slice with a thin layer of jam. Crumble/spread frangipane topping evenly over each (don’t worry, the jam layer won’t be totally covered at this point — the topping spreads out in the oven!). Top with the sliced almonds. Bake in the preheated oven for 15 – 20 minutes or until the bread is browned and the topping is golden and crisp. Allow to cool for about 5 minutes before serving. Best eaten while still warm! ¹ Tracking down Solo brand almond paste can be a bit difficult, even with the use of their store finder. Thankfully, they sell cases directly from the factory; at this time in the US, a 6-pack will run you $30 including shipping. Click here for a listing of their gluten-free products (not produced in a dedicated gluten-free facility). If you’re going with another brand, be sure to read over the ingredients label carefully — a more readily available brand that comes in a 7-ounce tube (Odense) contains wheat starch-derived glucose syrup. A few other recipes that use almond paste can be found here. What a great way to use old brioche! I never knew that there was gluten-free almond paste so thanks for the tip!